Medical Laboratory Technicians use and maintain equipment needed for medical diagnosis and treatment and are primarily employed in a clinical setting. Are you interested in our Medical Laboratory Technician Degree Program? The Medical Laboratory Technician program is a four-semester Associate of Applied Science program that will prepare students for the increasing number of career opportunities in the medical laboratory technician field. Students in the Medical Laboratory Technician program will complete classes in phlebotomy, anatomy and physiology, medical terminology, hematology, chemistry, immunohematology, serology, and more. 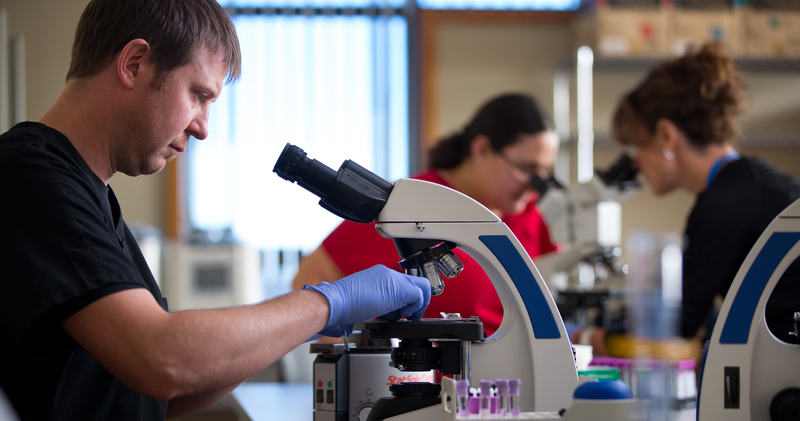 The Medical Laboratory Technician Program at Western Dakota Tech is currently applying for accreditation through the National Accrediting Agency for Clinical Laboratory Sciences (NAACLS). *Students are responsible for additional costs. The program director will assist students with any clinical or internship site requirements. Note: If you are or have been convicted, pleaded guilty or no contest to, or received a suspended imposition of sentence for a felony or certain misdemeanors, you are advised that you may not be able to complete all course requirements for your chosen program, you may be prevented from taking required certification/licensure examinations in your chosen program field, and you may be prevented from gaining employment in your program field. Students that sit out for a spring or fall semester or longer, will return under a new Catalog and may be required to repeat courses or successfully complete new or revised skills or competency assessments. Before re-admittance, the program may need to determine if a student is eligible to continue in technical courses. Program sequencing and cohort size may prevent enrollment in technical courses. Clinicals, practicums, and internships may include, but are not limited to differential shifts (evenings, nights, weekends, and holidays) to meet industry expectations. Clinicals may occur during summer semester depending on program enrollments. This may require travel outside the Rapid City Area. Tasks performed by Medical Laboratory Technicians may include analyzing body fluids and recording findings, studying blood samples for use in transfusions, operating sophisticated laboratory equipment, logging data from medical tests, discussing results of laboratory findings with physicians, and others. The median annual wage for medical and clinical laboratory technicians is $38,000 per year. Most medical laboratory technologists and technicians work full time. The health care industry is expected to continue growing through 2020.